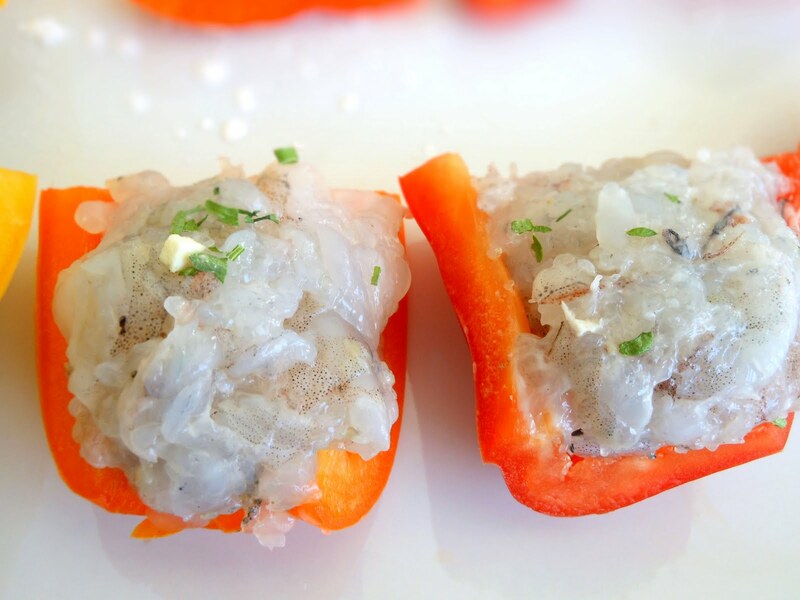 Shrimp-stuffed peppers is one of the dim sum dishes served in some Chinese restaurants. Green pepper is the most commonly used bell pepper. 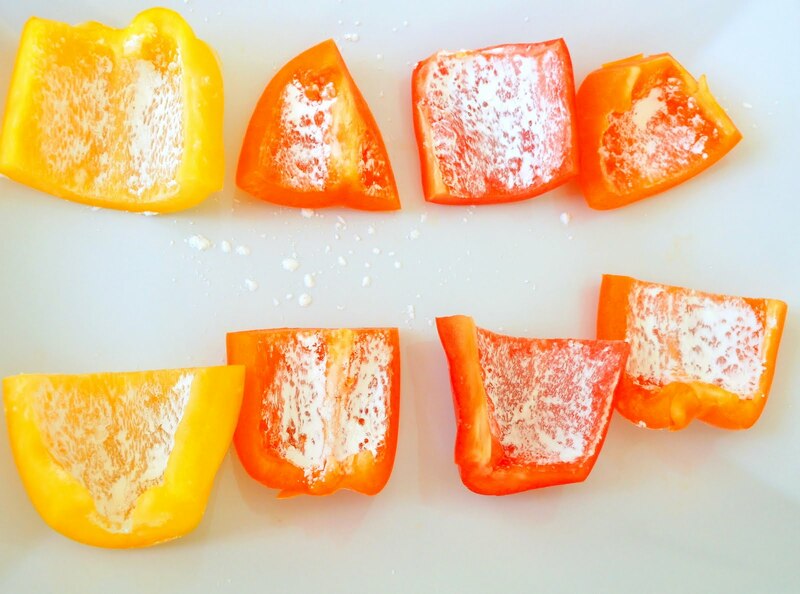 In my recipe, a bell pepper is cut into eight pieces. The easiest way to do this is to trim off 1/4" of the top, pull out the seeds and clean the inside. Then cut the bell pepper into quarters lengthwise and cut each quarter piece in half crosswise. Using a green pepper like the restaurants makes this dish look so ordinary, so I go with orange, yellow and red bell peppers. 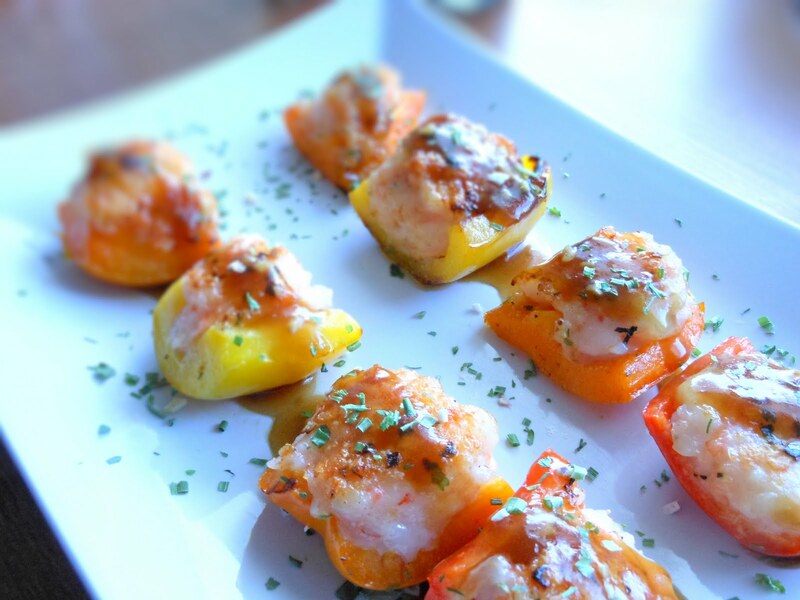 With all these bright colors on a white plate, it sure makes the bell peppers stand out. Since I only need eight pieces, I save the remaining pieces of the bell peppers for other uses. You can serve this dish as an appetizer. Rubbing a little bit of corn starch on each piece of the peppers. Put shrimp, corn starch, salt and pepper in a food processor and give a few pulses. Don't over do it. Just a light chop would be good enough. Lightly rub some corn starch on the inside of the bell peppers. This procedure is to prevent the shrimp paste from falling off when pan-frying the bell peppers. Don't put too much as the corn starch coating may not be cooked completely if the layer is too thick. Spread the shrimp paste on the peppers. Heat two tablespoons of oil in a flat pan over medium heat. Put the peppers in the oil with the shrimp paste side down for a few minutes. Then flip and pan fry the other side for another few minutes. Do this a couple more times or until the shrimp paste is completely cooked. Place them on a serving plate with the shrimp paste facing up. In a bowl, mix oyster sauce, soy sauce, corn starch and water together. Heat one teaspoon of the oil in a saucepan over low heat. Saute garlic in the oil. Add the corn starch mixture to the saucepan and cook until thickened. Make sure the corn starch is all dissolved before pouring the mixture. Remove from heat. Pour the sauce over the stuffed-peppers. Sprinkle some parsley, chives and serve. Double the sauce recipe if you want to have more sauce. Makes eight pieces. 2 servings.